Size of this preview: 481 × 600 pixels. Other resolutions: 192 × 240 pixels | 385 × 480 pixels | 616 × 768 pixels | 821 × 1,024 pixels | 2,986 × 3,724 pixels. This is a featured picture, which means that members of the community have identified it as one of the finest images on the English Wikipedia, adding significantly to its accompanying article. If you have a different image of similar quality, be sure to upload it using the proper free license tag, add it to a relevant article, and nominate it. This image was selected as picture of the day on the English Wikipedia for April 10, 2010. English: Part of a series of pictures depicting Frances Densmore at the Smithsonian Institution in 1916 during a recording session with Blackfoot chief Mountain Chief for the Bureau of American Ethnology. 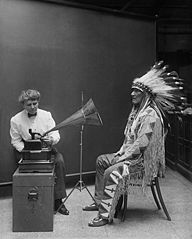 Library of Congress caption: "Piegan Indian, Mountain Chief, listening to recording with ethnologist Frances Densmore, 2/9/1916." National Geographic caption: "This 1916 image of Frances Densmore and Blackfoot leader Mountain Chief listening to a cylinder recording has become a symbol of the early songcatcher era." under the digital ID npcc.20061. Restored version of file:Frances_Densmore_recording_Mountain_Chief.jpg. Dust, scratches and stains removed, cropped, histogram changed globally and locally.